Chris Cayzer Returns in Tambayan Sa Kanto This Friday! 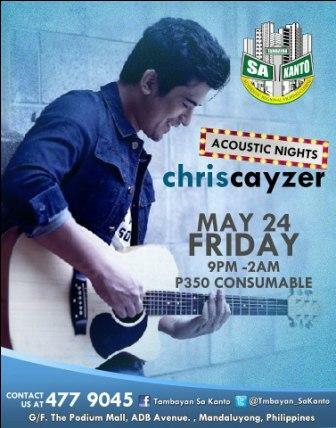 International heartthrob Chris Cayzer returns at Tambayan Sa Kanto this Friday night, May 24, 2013. Chris is featured in the restaurant's "Acoustic Night" where he will perform his music in acoustic touch! On the night, Chris will showcase his own versions of today's hit songs popularized by the RnB artists like Rihanna, Adele, Taylor Swift, Katy Perry, and Bruno Mars. Of course, he will also serenade the audience with the classic love songs we used to grew up with. This is actually Chris' fourth time in Tambayan. In April, he made successful performance in the said resto-bar. Tambayan Sa Kanto is actually a restaurant/cafe offering all type of Filipino cuisines. During lunch and dinner, the resto even serves an Eat-All-You Can buffet! Catch Chris Cayzer, enjoy the food and music! Come and visit Tambayan Sa Kanto located at the ground floor of The Podium, Ortigas Center, Pasig City. NOW ON #1 SPOT ON ITUNES PHILIPPINES!!! Rico Blanco Live - - - All Set on June 12!